In the spring, I posted pictures of some large patch in some of our zoysia. We do a preventative treatment for the disease in the early fall on all of our zoysia areas including tees, fairways and green surrounds which totals over 30 acres of fungicide to be applied. The preventative treatment in the fall is then followed up with a spot curative treatment in the spring where we only treat actively visible disease. Spring activity is usually more severe because the turfgrass is weak coming out of winter and the soil has a tendency to be wetter in the spring which keeps the disease more active for a longer period of time. Early last week, I noticed some pretty serious discoloration on the lake side of the 15th tee box. I investigated it later in the week and thought it could be damage from the Hunting Billbug larvae/grub which we have had some issues in the past. As I got closer to it I could see that it was actually large patch in zoysia. If memory serves me right, I don't think I have ever seen this disease work in August. The cool soil temperatures made conditions right for this disease to become active. We will probably have to do a spot treatment in this area and will probably begin to apply our preventative treatment in the next 7-10 days or so. What a strange season it has been! This spot is actually on the tee surface of #15 main tee and is on the left side of the tee and goes down in front of the tee. The outer edge of the circle is orange in color and shows that the fungus is actually growing and active. The right front corner of 15 tee bank. My first thoughts were of insect damage but it turns out it is large patch on zoysia actively chewing away on this tee bank. This tee does face to the west but is under some pretty serious shade issues from 2 large oak trees behind the 14th green. We also have some moisture issues on this tee since the back of the tee is at ground level and excess runoff from the 10th fairway keeps this tee above average in moisture content. Greeting all who will pet her, riding on golf carts, sniffing out squirrels and bunnies and laying in the pro shop air conditioning when its hot are some of her favorite things in life. Begging for food I think is probably her favorite as some of you can attest. I had my camera with me the other day and we were around our lakes trying to move a few geese around. Lady has never been a huge fan of swimming after geese but she will do some chasing to the waters edge. I can probably count on my hands and toes the number of times she's actually swam out and sent them on their way. Well, last week, they were honking and a fussing after she chased them into the middle lake next to the fairway nursery. She's gets pretty agitated when they won't shut up so she swam out to greet them. I had my camera with me but missed the first picture of her efforts. They flew into the main irrigation lake on 15 where she went after them again as you can see from the picture but I called her back to shore since they were on the opposite side of the lake. Any golf course that has bermuda as one of its turfgrass components, deals with bermuda grass contamination in areas where it is not wanted. Fairways, tees, rough and greens/collars. Most of us have been tempted to grab a runner or a chunk of bermuda and pull it out of the ground. Pulling a chunk of turf or runner out of the turf can create some damage that is not easy to heal or repair. The pictures below illustrate this issue. We began chemical treatments last fall that discourages the bermuda from tacking down. The ability to form new roots at other parts of a runner helps to strengthen the turf and allows it to spread further. The inability to root in additional places reduces its overall strength and ability to survive, especially over the winter. Around our greens, the bermuda was slow to fill in this spring so we refrained from applying this material. This allowed the bermuda to grow back in place and we are now facing the same issue again this fall. We are preparing to apply our second application in the late summer to reduce the influence of the bermuda grass on our collars, approaches and greens. As you can see, we are increasing the use of fescue around our greens which will allow us to continue to spray some sections of our collar surrounds. We are also building a collar height nursery in which we plan to use in the fall next season to replace poa and bermuda infested collars with bentgrass but that will be next season late in the year. I appreciate the efforts being made to physically remove the bermuda but I am asking that members resist the temptation to remove this material so that we do not create a visually displeasing spot on the collar of a green or an unplayable lie on a collar. It is the time of year where Hornets build their nests. They are built in trees, normally at the end or near the end of a branch. They can be 6' off the ground or 20' off of the ground. Below are a couple of pictures of a Hornet nest which we saw last week. This is in a maple tree that is between #1 tee and 18 green just below the pro shop. We went out early one morning before sunrise and killed the nest because of the danger from stings for our members and employees who might be nearby. The insecticide we use has a propellant that can go approximately 10 feet. If you would happen to see a nest that is in a tree, please alert the pro shop or one of our staff members so we can determine if we will attempt to eliminate the hive. If a nest is 15-20 feet in the air, there should be no issue and it would be very difficult if not impossible to do anything to the nest with the equipment we have on site. Motorized equipment create wear and tear on the golf course. We have been lucky to have a mild summer and some nice rain over the past 3 months. As summer comes to an end and fall begins, our turfgrass is transitioning as well. It has been mowed and been driven upon thousands of times by our maintenance equipment and golf carts. We attempt to reduce this wear and tear with the various cultural practices we perform on the turf. We also attempt to reduce mechanical wear and tear by changing our routes, not mowing during wet conditions and utilizing a lighter weight piece of equipment. On the course, we use different items to help us control cart traffic. We restrict carts to fairways to help reduce damage to the rough. We have the green and yellow stripped exit posts in which we ask our members and guests to not drive their cart past these stakes toward our green approaches and proceed to the cart path. We use directional signs, ropes and stakes to reduce wear patterns and keep carts out of wet or damaged turf areas. The picture below illustrates some wear from golf carts coming straight down the hill on #3 and using the walk path to drive onto the fairway. Sometimes a ball might be at the bottom of the hill just at the beginning of the fairway. It would be best if all carts entered from along side of the fairway and not from the tee side of the fairway. The area is much longer along the side and can distribute the traffic patterns in more appropriate way. It is also more visually pleasing to see the hole without cart traffic driving straight through the rough and directly into the fairway. Bring the cart more perpendicular into the side of play improves the overall playability and look of the hole. Walk paths should be avoided by carts because they are cut at 1 1/3 inches which is half the cutting height of the normal rough height which makes it more susceptible to damage from cart traffic. Also, another thing to keep in mind when you are operating carts is to attempt to drive from the fairway to the cart path in a nice area of rough instead of following the path of other carts. We attempt to move our stakes, ropes and signs on a regular basis but on a busy day, 50-60 carts could be potentially driving over the same area. Driving 15-20 feet in a different direction would be much appreicated by our tired old grass. No doubt there will be some wear patterns developing in some areas. With our traffic control efforts and our members knowledge of how to reduce cart traffic damage, our turf should be able to withstand the pressure that motorized equipment can create. I've been trying to post a number of videos over the past week but for some reason the videos will not upload. Needle-tine venting, Mad-Tiller disease and maintenance of the range tee are and were a few of the subjects to be discussed. I'm attempting to contact blogger support for an answer. In the meantime, we will go back to still photos in posting information. The woodland garden which is around the dam side of #9 is irrigated and has heads that are right at the mulch/grass line. As our mowers go around the edge of the bed, they have hit a head or two along the way. Assistant Skip who was repairing a head one day, suggested we expand the edge of the bed out one sod strip which will place the heads two feet into the bed and will eliminate our issue. Good suggestion by Skip. Last week the guys stripped the sod out, formed a nice edge for holding the mulch in place, weed eating and then hauled in some of the chipped oak mulch we made from the brush that is removed from the golf course grounds. We do need to improve some plant material on the tee side of the woodland bed but our goal this season was to get the weeds removed and get the bed under control. We've also attempted to improve the overall look of the bank and reduce erosion of the bank with some cocoa mat fiber which has appeared to work well so far. Jose after the sod was removed forming the edge. Russell was doing the same a little further around the curve after operating the sod cutter. Ornamental plantings, most good, a few not so good! Our ornamental beds continue to improve with each passing day. We've had some really good plantings and a couple of real stinkers but that is they way it goes sometimes. I wish we did not have any stinkers but prefer if we have one that they be flower beds and not golf greens. Our intial plants were on the small side and were not wide based which helps to build the strength in most ornamental plantings. Not enough pinching of the plants were done and our pots probably need to be slighly larger for next season. Also, delaying a week or two the planting would also reduce some of the plants which flowered early and used up some valuable energy when planted. We will be doing some research in the late fall and early winter on new varities of plants and will tweak our overall program. A meeting or two will be on our calendar with the GPHA(Greater Professional Horticultural Association) comprised mostly of those whom support or work in the country club golf horticulture industry. The planting along the walk path to the pro shops have been growing well. The orange zinnias with the purple mexican heather and the Angelonia have done well. The melopdium in yellow and the New Look celosia in red have been a good combination as the mixed colored coleus and the green eyed susans which are not pictured. Assistant Mike planted Dr. Ott's clock. Not a lot of plant experience but did a nice job. The two big pots in front of the pro shop are nice with the dragon wing begonia, black pearl pepper, yellow coleus, red pentas and red surfinia petunias. I've been a little disappointed in the petunias, they have not done very well in any of the beds. The bed near the short range is contineuing to improve. I think in the next couple of weeks the 3 giant copper plant will be spectacular as they continue to increase in size. The front of the clubhouse continues to expand. The hostas are beginning to flower but the white nicotiana in the front is rather weak. The gold mound coleus and the zinnia appear to like each other. They are blending in well together. The mound is continueing to improve but is a bit disappointing. Too wet in early season, too wet in mid season and hopefully will be better from this point on. Is showing some good signs on the road side with the yellow coleus and Angelonia beginnig to expand. I think the mound is due for a major overhaul before next season. The liriope is overgrown and full of weeds and the bushes on the clubhouse side are worn out as well. A major disappointment for me this season. The red salvia at 13 tee have improved drastically but the salvia that were to be in the middle of this bed had to be pulled out. I replaced them with some verbena that looked great initially and have since began to fade away. The ageratum in front and blue salvia in the back have been ok but I'm sure having trouble with this guy. Maybe mums in the middle are the answer. Still kind of early but pretty late for anything else. The giant copper plant is doing its thing as the anchor on each side of the flagpole bed. The shrimp plants are dong well too! The main entrance pots are doing fairly well. Elephant ears are doing well as is the diffenbachia trailing over the edge. The planting next to the scoreboard is rounding into great shape and is great to see from the road. The pink impatiens fire up each end and the combination of purple, yellow and silver in the middle from the plecanthrus is doing well. Hopefully, we will get some good scent from the purple heliotrope in the next month or so. This pot was upstairs on the patio but thought more would enjoy it down by the scoreboard. Our hollowed out tree trunk has made for an awesome planter on the right side of the scoreboard. Thanks again to Dr. Barton for the cannas which majestically keep climbing higher and higher. The banana tree planter continues to improve as well. I'm slighly disappointed in a couple of the other planter on the patio. Too wet, too dry, more fertilizer, wrong plants. Even the sweet potato vines don't look happy. The bed underneather the weak and dying cherry tree improves with each day. A bit disappointed in the front and back of the bed but everything else is doing well. The green eyed susan's are doing great on the property. A bed that is 2/3 good but will improve with age. Front 1/3 died or was pulled out before invitational and the replacements are slow to move. I think this will improve in time as well. Its going to have to because we are done planting for the season. The bed at the field bar continues to improve. We are trying to rid the tree of the critters that are harming its leaves. The coleus and celosia continue to expand and fill in place. Ahhh, what a dog, I mean flower bed. That black shiny coat sure brings out the colors in those flowers. I know some wonder why two contrasting beds side by side. I can't answer why except that in my artistic moment of planning the beds, I thought two beds of the same type would be boring and only give you half the pleasure. As you would walk on and off, you would only have to look once. Now you have to look twice because there is something different on both sides. 4/12 tee bed will improve in time. We removed the false sunflower which were too large and would lay over on their side. This bed will flower well into fall and should attract some nice butterflies. I'm really proud of the flagpole bed. I felt we needed some plants with some height but we also needed to see through it to enjoy a great entry shot into the 18th green. I've always loved the chinese foxtail grass because of its height and flower. The chartruse color of the sweet potato is blending well with the reds, oranges and purples. The flag pole itself is covered in reds, and blacks and the black pearl pepper plants are doing well. April through October are the most active months that our rough turf is growing. Certain signs of stress will show up where the turf is thick and difficult to play out of or might be thin and weak. Some of the stressed, thin turf is caused from the heat as well as some disease but most of the stress is related to moisture deficits in the soil. During periods when we receive a nice amount of rainfall every week from 1/2 an inch up to 1 inch, the turf will stay in fairly good shape. There is adequate water for the turfgrass underneath the trees and for the trees. Once temperatures become high and rain is reduced, we begin to see rings underneath trees where the roots of the trees out compete the roots of the turfgrass for moisture. These rings usually go out to the drip line of the tree which is basically as far out from the trunk of the tree that the braches stretch. Over this past week, we began to see some of these issues. The picture below is looking from about the 150 yard mark on #12 back to the tee box. You can see the stronger turf to the left 1/2 of the photo and the weakened turf toward the tree line. Some of the weakness in the turf on the right is because of the turf species that dominates this area. Poa annua is highly competitive underneath the tree area and is the dominant species. The turf to the left consists of turf type tall fescue and bluegrass/poa annua combination. These grasses can handle the higher light that is received along the fairway. There are no species that will grow vibrantly under full shade and very dry conditions mowed at golf course rough height in our climate. We have a very good irrigation system but there are weaknesses in every system. Most systems do not adequately place enough water under tree lined areas. A majority of our system is set up the following way. Each fairway has a row down the middle and outside each fairway in the rough on both sides there are rows of heads. The heads turn full circle. The middle row of heads are used less frequently because the rough turf requires more water than our zoysia fairway turf. If we run our center rows or even our outer row heads an excessive amount, this can lead to the zoysia fairways to be weak and creates a soft, unhealthy golf course. The heads run in a line from tee to green and are spaced about 75" apart which allows for a majority of the heads to overlap other heads in a full circle. We also have additional heads throughout the course between areas 1/18, 16/17 and other areas so that a majority of the property can have water at any one time. The picture below is from about 100 yards out on #3 looking up toward the green. One of the benefits that the new irrigation system gave us beside a much improved system, when the larger main lines were trenched in place, the roots of trees were pruned. The trench went about 24-30" deep which literally cut the roots of the trees, basically pruning like you would do a shrub above ground. In the picture below, the main line runs up the right side of the trees. This is where the trencher went. It takes a few years for the tree roots to begin to compete for moisture and nutrients again. Some stress can also be created by high concentration levels of cart traffic in some areas. This is why carts are asked to stay in fairways to reduce the impacts on our rough turf. The picture below is looking back toward 4 tee from about 50-75 yards from 4 green near the 5 tee area. There is also a main line that runs to the left side of the trees in this area. You can see that the turfgrass is not match for the trees when it comes to the ability to take up water. Also more light creates healthier turf. Some of the turfgrass near the fairway is bermuda grass. As you know, bermuda is a horrible rough to play in at 3" or more but is very green in the summer. The majority of the turf in the left side of the picture is cool season turf. As we get closer to September and weather continues to benefit our turf, we will begin to lower our height of cut in the rough. What can or should be done to improve this situation? Continue to monitor mowing heights and reduce the mower frequency in areas that have weaker turf. Replace larger 11 foot rough units with smaller and more maneuverable units that can easily avoid worn or weak areas. Improve water to these areas by placing some heads which line the fairways to part circle which will double the amount of water to some rough areas. This could create a deficit in the fairway. We would need to monitor this situation to make sure we are not making negative impacts to our zoysia fairways. Add heads where practical and possible. We do pay for water to recharge our irrigation lake once it is at a certain level. A couple of nights using 200-300 thousand gallons of water will require the tap to be opened. Improve and increase aeration to tree areas. We need to improve aeration to all rough in general and use soil penetrants or wetting agents in heavy tree areas. Aeration also reduces weed populations because the turf grass is stronger and conditions such as compaction do not encourage the growth of knotweed which is one of our more prominent weeds. Removal of selected trees which reduces tree root competition, improves sunlight and allows for more desirable species of turfgrass to survive or be planted in these areas. A spider had taken up residence on the Hole sign on #13. What a beautiful web spun by this interesting creature. I thought I would share this interesting sight with you. Its been a while since I've place Lady in a picture but I could not resist showing off a couple of her as well. She is a little serious in the picture below. I think I told her to stay which does not make her happy. The side view I think I used the "bunny" word which is one of her favorite animals to chase. The 3rd main tee has not looked well since early in July. It is a cool season tee made up of bentgrass, poa, rye, and blue grass. During the heat spell in June, we increased water on a majority of the course. This tee became dry during that period and then we over compensated our watering program and the tee then became too wet. We were also using a growth regulator on our cool season tee boxes since May to reduce the competitive advantage of the poa on the cool season tees and control the overall growth rates. This included tees on holes 2, 5, 10, and 11. Overall the regulator program was working pretty well but with the combination of the wet condition, diseased turf and the restriction of the poa plants, we began to lose turf. We've got our watering problem managed, our preventative spray program is where it needs to be and we've taken the growth regulator out of the rotation at this time. Last week we slit seeded two directions with rye grass in the weakened turf areas. We have also been rotating tee locations at times to the alternate tee to reduce playing traffic. We also sprayed some micro-nutrient package on the tee to improve its overall health. Some heat is coming on in the next few days but I expect the tee to continue to improve and be in good shape in the next couple of weeks. A majority of the weakness in the tee is on the left 1/2 of the tee and the front and back sections of the tee. The right side of the tee is for the most part in normal condition. The view below is from the front of the tee to the back of the tee. 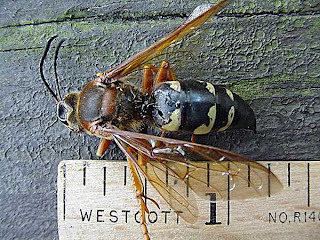 Cicada Killer wasps have now arrived upon the grounds at Glen Echo CC. This wasp normally is not harmful to humans but they do have the capability of stinging a person. The female of the species is the only one that can actually sting a person. They like to burrow into bunker banks and green banks. Two of their favorite locations are the right green bank of #3 and the complete bank on hole #17. We would normally leave this creature alone but they burrow into the ground and push their the dirt they've excavated out of their tunnels into a pile. This pile is rather unsightly and will kill turf grass if left unattended. They are also capable of burrowing into finer turf areas such as greens. A superintendent from Virginia reported that he had 20 burrows on one green this summer. We spray insecticide down into the burrow of the insect once it has been made. We will also use a tennis racket to knock the flying wasps out of the air to reduce their impacts on our turf. The link below gives some great information regarding this insect. The picture below is a view of this insect. The picture below gives you an idea of the amount of dirt these insects put out onto our turfed areas. That two-way radio is about 6-8" long and about 3" wide. A fairly substantial amount of dirt that can be placed out on the turf. Once we spray the dens, we will then kick the dirt around to prevent too much damage to our turf. The tennis racket and the mounds behind 17 green where you might see us swatting at these insects from time to time. We use the tennis racket so we can use less insecticides.